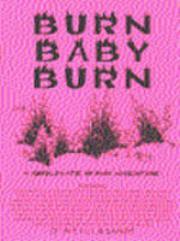 Burn Baby Burn is a Kobolds Ate My Baby Adventure. Warning: Please note that the makers of this game do not support arson, disco music, or other potentially fatal misuses of polyester. We do not condone the occult, black magick, or reunion tours of old rock stars. We prefer warm and fuzzy hugs as a way of reconciling our differences, but we understand that no one wants to buy a game about warm fuzzies (unless, of course, they are murderous warm fuzzies of death!). Remember, don't play with fire - just play this game. Possession of this game is punishable by death in the city of Cleveland.